Puppy mouthing, biting, nipping, whatever you want to call it, is a normal behavior of dogs when they are very young. The number one way that they learn about their world is through their mouth. Just like human babies, the goal is exploration and they are not acting aggressively. When a puppy is born, his sense of smell is active allowing him to find his mother and nurse. As the puppy grows, they use their mouth when they explore their surroundings and play with litter mates. They play fight, nip and get nipped as they learn. 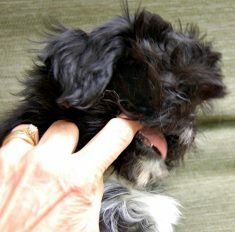 Their sharp baby teeth can hurt, so gradually they learn through this give and take to adjust their bite so it is not too hard. Puppies will mouth their human if allowed to do so. Learning to gently mouth another dog is a significant step for a young puppy. But they may not master this skill entirely by eight weeks of age when most puppies leave their mother and siblings for their forever home. Now they depend on humans for this type of play. It may be perfectly acceptable for puppies to mouth and nip at other puppies, but not when they do it to people. We must teach them that our skin cannot be a play toy. There is a big difference between an 8-week old puppy that is unaware of what he is doing when he mouths you and a 7-month-old pup mouthing you for attention! Most mouthing occurs when you pick up your puppy and cuddle her. Your hands become her toy. To avoid being a toy, there are ways to teach her that puppy mouthing is not acceptable. Have a soft toy handy for her to chew on instead of your fingers. Encourage the puppy to mouth the toy. You can praise her for mouthing the toy. If she mouths you, it is perfectly acceptable to make a soft sound that indicates you have been hurt. Then, put the puppy down, turn your back or walk away. If your puppy is being very gentle then you may let some of the very light mouthing go by without a cry. This is because your puppy is learning to mouth gently as it would with his siblings. Eventually though you want your puppy never to put her teeth on skin or clothes. You want the puppy to learn to mouth a soft toy and not a person. Usually around 4 months old a puppy should have stopped mouthing people. However, what happens if he continues past his four-month-old birthday? Once your puppy gets close his five-month mark, the consequences need to be more obvious. Continuing to allow an older puppy from mouthing can lead to adult behaviors that are harder to correct and the last thing you want is for an adorable puppy to turn into a biting adult dog. This mouthing habit could become a well-established way of getting your attention. Puppy mouthing is just one of the many behaviors that are typical and expected, even cute and tolerated in an eight week old. If you do not know how to curb some of these behaviors, however, all that cuteness can disappear quickly as the puppy grows. Best of all, I am gaining confidence in my abilities to train my own dogs, all 15 of them.